For 2015 we wanted even more power and torque! So we tweaked the cams, installed bigger valve springs and optimized the fuel map to give you 110 horses of High Output power. Dual overhead cams (DOHC) actuate four-oversized valves per cylinder, slamming a huge fuel charge into the combustion chambers of the engine for maximum performance and minimal weight. Designed specifically for extreme performance, the Polaris ProStar® 1000 engine features 999ccs of big bore twin displacement and all of the hallmark ProStar® features. This includes dual overhead cams, electronic fuel injection, and 4 valves per cylinder. It also features 48MM throttle bodies and long-tip fuel injectors giving the 2015 RZR XP 4 1000 instant throttle response, quick to rev characteristics, and the highest horsepower in the sport SxS market. NEW HIGH PERFORMANCE ON DEMAND ALL WHEEL DRIVE SYSTEM Most Responsive to Driver and Terrain. The new High Performance AWD seamlessly engages both front wheels with full torque to pull the vehicle over washboards and whoops, and maintain the line all the way through corners. ALL NEW TUBULAR CHASSIS FOR BETTER HANDLING The new cab frame sports a stylish, custom-look profile, which is 3.5” lower than the top of the RZR 4 900. The all new chassis is constructed from tubular steel, reducing flex by 20%, which keeps the tires planted and delivers more precise cornering and ultra-responsive feel. ALL NEW FRONT CABIN WITH 7 UPGRADES TO THE CABIN FOR THE MOST COMFORT AND CONVENIENCE OF ANY RZR. New Front Cabin Interior NEW High performance steering wheel with 10" tilt adjustability New center storage box with cell-phone holder & larger glovebox Driver and passenger Footrests LED interior lighting front and rear Adjustable seat slider for both driver and passenger New Dryseat technology resists moisture ALL NEW Factory Installed Doors Easy one-handed operation, with secure latch and rugged feel. Quarter-doors make getting in and out easier, plus offer extra elbow clearance for roomier interior. ALL NEW PASSENGER CABIN WITH NUMEROUS UPGRADES TO KEEP THE PASSENGERS COMFORTABLE ON EVERY RIDE. Getting in is easier- factory installed quarter doors with easy one-handed operation, secure latch and rugged feel. Roomier cabin- 1" more legroom, deep foot well with angled footrest, sculpted front seats for more legroom, especially when the front seats slide forward. Secure feel on the ride- new comfortable seats with added bolstering (adjustable with tool) and new Dryseat technology to resist moisture, with full-width handholds. Convenience features- LED floor lights on both sides of the passenger cabin, floor cleanouts, 2 cupholders, and a 12-volt outlet. 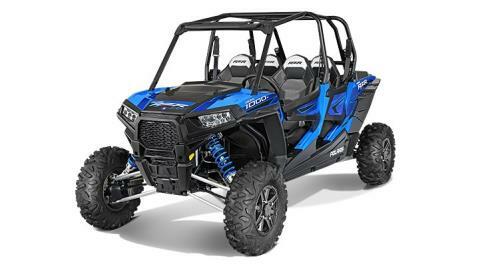 The front cabin of the RZR XP 4 1000 offers the most comfort and convenience of any RZR. Factory Installed Doors feature Easy one-handed operation, with secure latch and rugged feel. A High Performance steering wheel with 10" tilt adjustability and center storage box with cell-phone holder place everything within reach, including the re-designed glovebox with a new quick turn latch. Driver and passenger footrests and adjustable seat sliders allows you to fine tune your seating position and Dryseat technology resists moisture, while LED interior lighting adds a touch of style. Keep your new RZR 4 1000 clean with these new driver and passenger side removable floor drains. The design allows you to simply washout debris and mud quickly and easily. The On-Demand True All-Wheel Drive System is revamped with an 80 percent improvement in strength over the standard system. The result is the most durable front drive system ever found on a RZR. The system features a brand-new, close ratio final drive to keep the front wheels pulling stronger and longer maximizing power delivery to the ground on even the loosest terrain. The reduction provides increased traction without sacrificing steering effort to provide unmatched point-and-shoot handling. 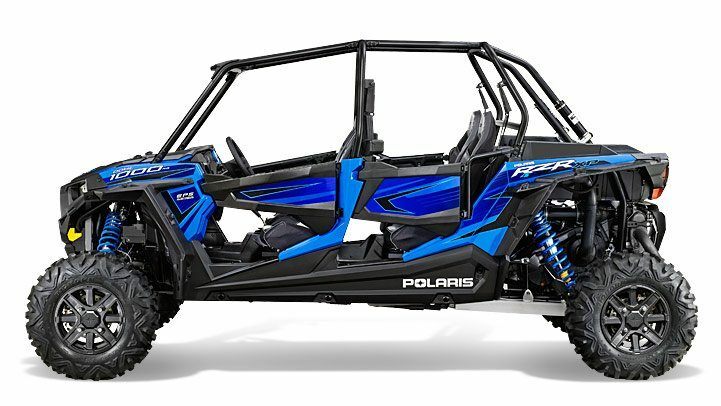 The RZR XP 4 1000 features an industry leading 13.5-inches of ground clearance giving you plenty of room to transition over obstacles in harsh terrain, and turning radius is critical when it comes to agility so we feature a quick 2 turn lock to lock steering ratio to maintain a tight turning radius. THE ALL-NEW PROSTAR 1000 The all new ProStar 1000 delivers unmatched torque across the entire RPM range- ample power for mud, sand, and other terrain, even with 4 passengers. 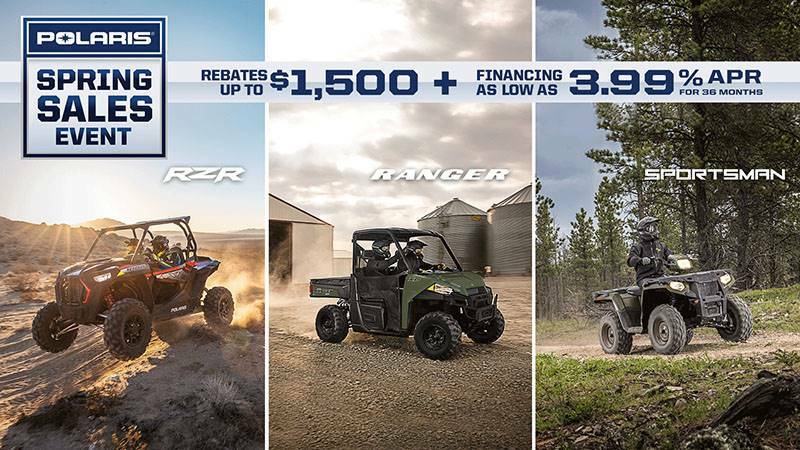 LONG WHEELBASE FOR A SMOOTH RIDE FOR 4 The RZR XP 4 1000 has an advanced suspension and long body for both performance driving and family cruising. You get the most control and smoothest ride with 16" of front travel, 18" in the rear with long wheelbase to smooth out the ride. 16-position adjustors make it easy to dial in the right ride with any set of passengers. EASY SHOCK ADJUSTORS With huge suspension travel and 16-position shock adjustors, it's easy to dial in and maintain the perfect ride. And with sophisticated needle shock technology, the ride is always smooth and controlled. The new race-inspired 3-link trailing arm rear suspension serves up an incredible 18-inches of rear wheel travel. Matched to an astounding 16-inches of front suspension travel and 13.5-inches of ground clearance, the king of the RZR XP family conquers the worst terrain Mother Nature has to offer.